The implementation of Republic Act 10533 or the K to 12 Law aims to enhance the basic education system to ensure that the country’s graduates are at par and can compete with their global counterparts. After two years of implementation, thousands of Senior High School students will either join the workforce or continue their education for higher learning. On 10 October 2017, three beneficiaries of DOLE-AMP; Ms. Irma Escobia formerly from FEU, Ms. Lucille Valencia from Adamson University, and Mr. Sonny Wetack of AICS; visited the DOLE-NCR Office to express their gratitude for being extended said intervention. During the interview, they articulated their heartfelt thanks to the program as the financial assistance enable them to sustain their expenses while in transition. Ms. Valencia, an architect by profession, looked at the displacement on a positive light saying “may oras na ako para sa anak ko at para ma-reconnect sa mga dating estudyante ko; mga kaibigan at kilyente ko na sila ngayon”. Mr. Wetack on the other hand, mentioned that the financial support enabled him to continue his medication as he suffered a stroke in mid-2017. For her part, Ms. Escobia thanked the DOLE for the support as she and her husband were both affected by the implementation of K to 12. “Maraming salamat sa DOLE dahil malaki ang naitulong nito sa pamilya ko at ito din ang ginagastos ko sa paghahanap ng trabaho”, said Ms. Escobia. 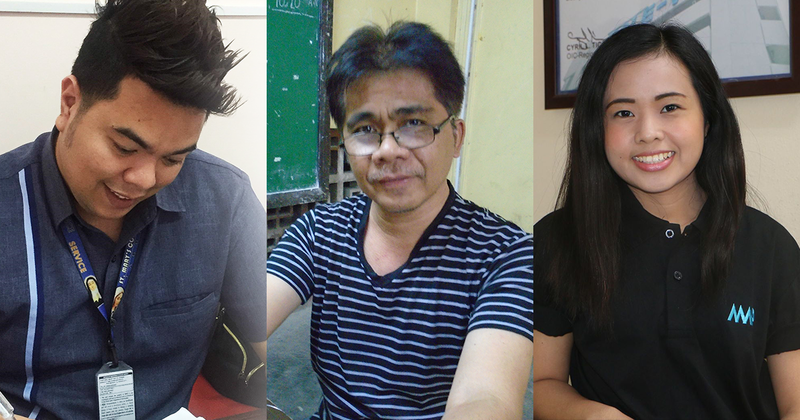 When asked of their experiences with the staff of DOLE-NCR, all three were unanimous in saying that the staff are warm and accommodating in their approach. “Wala silang inisip kundi ung comfort naming mga beneficiaries. Lagi kaming updated through call and text.” They specifically mentioned Ms. Hershey V. Aquino and Mr. Arnold Gratuito, Program Technical Staff for their support in understanding the needs and putting the welfare of the program beneficiaries as their topmost priority. The implementation of the K to 12 likewise entails changes in the higher education landscape particularly on its personnel. Many higher education institutions implemented measures that resulted to displacement of both its teaching and non-teaching personnel. In response, the Department implements the DOLE- Adjustment Measures Program with the aim of softening the adverse effects of K to 12 to the affected workers of the education institutions. To date, DOLE-NCR facilitated and provided the assistance to 369 displaced HEI personnel. The K to 12 DOLE AMP Program Management Office (PMO) is established at the Department of Labor and Employment-Bureau of Local Employment, under the supervision of the Undersecretary for Employment and Policy Support Cluster, to oversee the implementation of the program at the national and regional level.